A lot in Milwaukee has changed since the era of Happy Days and Laverne & Shirley. Though you can still stop to see the "Bronze Fonz" statue on the Riverwalk in the centre of town, Milwaukee on the whole has grown up, just like Richie Cunningham. In recent years, the city has blossomed into a world-class destination complete with chic urban dining, art museums, microbrew pubs, small-batch distilleries, plus a variety of top-notch accommodation. 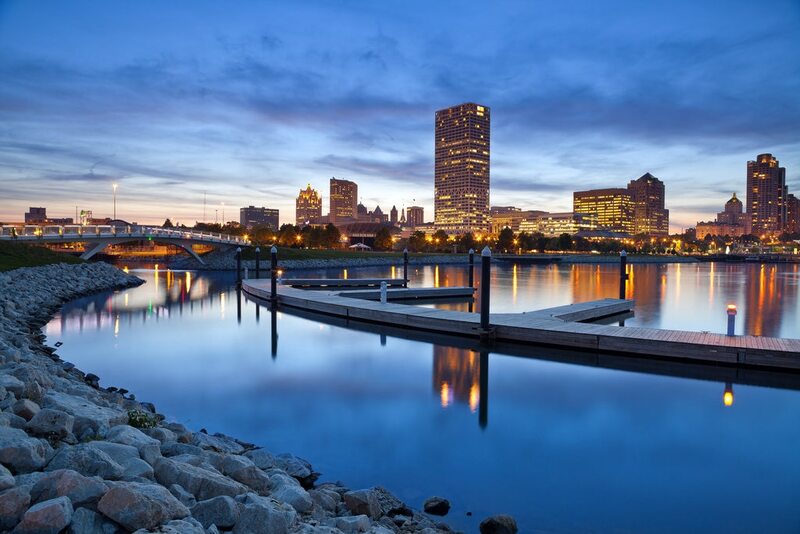 Once you visit Milwaukee, you'll be asking yourself, "Why didn't I come here sooner?" A desire to attend the famous Summerfest Music Festival inspired our visit to Milwaukee. The event unfolds on 11 stages over 11 days every June, and has done so for the past 35 years. It's the world's largest music festival, and plays out on the shores of Lake Michigan. For less than $20 a day, you can check out acts ranging from the new to the unknown to the top performers on Earth. Over the years, Summerfest has attracted everyone from Stevie Wonder and Bon Jovi to Tim McGraw and Britney Spears and each year 800,000 to 1,000,000 people attend. The Milwaukee Art Museum is also a must-see attraction. The building was constructed with a giant moveable sunscreen in the form of two huge panels that look like sails-they actually have the wingspan of a Boeing 747. Each day at 10:00 a.m, these sails open up, creating a dazzling display. Whether or not you enjoy art, this spectacle, created by Spanish architect Santiago Calatrava, is well worth a watch. Be sure to visit the Harley Davidson Museum as well. This iconic museum traces the humble beginnings of William S. Harley and Arthur Davidson, the duo who started their business in a Milwaukee machine shop and grew the company to become one of the most successful motorcycle manufacturers on the planet. The museum displays motorcycles and memorabilia. There's a virtual ride room where you can take photos while sitting on a Harley, and an Evil Knievel video game where you can try to jump a shark. If you are a movie buff, you also will love the display that showcases all the movies that have featured a Harley Davidson. Milwaukee is definitely a beer town and stopping at a microbrewery is a must. In particular, we enjoyed a stop at the Lakefront Brewery, where we were entertained with X-rated humor by the hilarious "Brewery Navigation Specialists." They taught us all about the local brew while keeping our beer cups filled to the rim. Another way to immerse yourself in Miwaukee's food culture is the Milwaukee Food Tour. This guided jaunt starts at the Riverwalk and teaches about the German heritage of the city, showcasing Usinger's Sausage, the Wisconsin Cheese Mart, and Mader's Restaurant, which has been voted the most famous German restaurant in North America! If you want a truly great night out in Milwaukee, check out The Safe House, a speakeasy-style bar. Once you find the secret entrance, you have to figure out the password to be allowed entry. Inside, you'll be entertained by kitschy spy memorabilia and other curiosities such as a swinging wall, a trap door catapulting drinkers out of the floor, and a giant puzzle on the wall that usually confuses tipsy guests. The adjoining Milwaukee Press Club also is worth exploring. It is the oldest continuously operating press club in North America, dating back to 1882. Signatures on the wall include those left by the likes of Franklin Delano Roosevelt, Bette Davis, Babe Ruth, and Barack Obama. Speaking of old, the oldest cocktail lounge in the city is an intriguing spot for a nightcap. Bryant's Cocktail Lounge offers more than 400 specialty-crafted cocktails. When you enter the dimly lit room reminiscent of a 1960s Vegas lounge, tell your server what type of mood you are in. He or she will see to it that the bartender matches a cocktail to suit your taste. It's definitely more personal treatment the Fonz and Richie received in their day. And that's what makes it fun. Dave and Deb wrapped up their tenure as Expedia Viewfinder bloggers at the end of 2015. They continue to inspire adventure in everyone. They've spent 8 of their 15 years of marriage exploring more than 100 countries on all 7 continents inspiring their international audience to follow their dreams and push their boundaries. Dave and Deb prove that ordinary people can live extraordinary lives. As spokespeople and brand ambassadors, The Planet D have had the opportunity to work with some of the world's top companies and have spoken around the globe about pursuing passion and what it takes to make it happen. They've appeared regularly on TV and have been featured in such publications as The National Post, BBC Travel, and National Geographic.